Removing corn kernels from cobs has never been easier. This Corn Stripper features a container that catches the kernels as they are stripped from the cob. Simply push the Corn Stripper down the length of the cob and the kernels collect in a convenient container (approximately one cob). Turn the cob and continue stripping until all kernels are removed. This corn stripper is able to secure the corn nicely and keeps you peel the corn effortlessly. It is very compact, lightweight and very easy to operate, a wonderful tool to have in the kitchen. *Made with Premium ABS Body and Stainless Steel Blade, sharp and rustproof, strong hardness, wear resistance and corrosion prevention, more durable use. The ergonomic, firm handle with the fixed link design holds the corn sturdily while removing kernels safely and neatly. *Easy to Disassemble and Clean - This corn stripper can be disassembled without much effort for easy cleaning. Just rinse the device with water and use your hand to remove some leftover corns on the blade and it is also dishwasher safe to save your time! *Effortless Mess-Free Corn Remover - Corn stripper/ Corn Peeler can peel two corn cobs in just one minute with quickly cut and collect inside built-in compartment. Sharp stainless steel blade design makes stripping corns easier and faster! No repairing, No electricity required; Save your time and effort in cooking. *Concave and Convex Design - Corn stripper adopted concave and convex design. The anti-slip handle ensures effortless operation and injury prevention while rugged finish on the body helps you to hold it steady on the table even when your hand is wetting. *One Vegetable Fruit Skin Peelers for Bonus - This peeler works greatly to save your money and time. It just removes the peel itself so almost your entire apple was intact. Perfect for peeling on most fruits and vegetables, such as apples, pears, lemons, cucumbers, potatoes, carrots, zucchinis, tomatoes, squashes and radishes. -With fine workmanship and durability: the blade is made of high quality stainless steel, with high hardness, wear-resistant, anti-corrosion, no distortion. -This useful corn stripper adopts jagged design, which can strip corns faster and more convenient without hurting your hands. -Anti-slip handle to ensure effortless operation and injury prevention. Rugged finish on the body helps you hold it steady on the table. 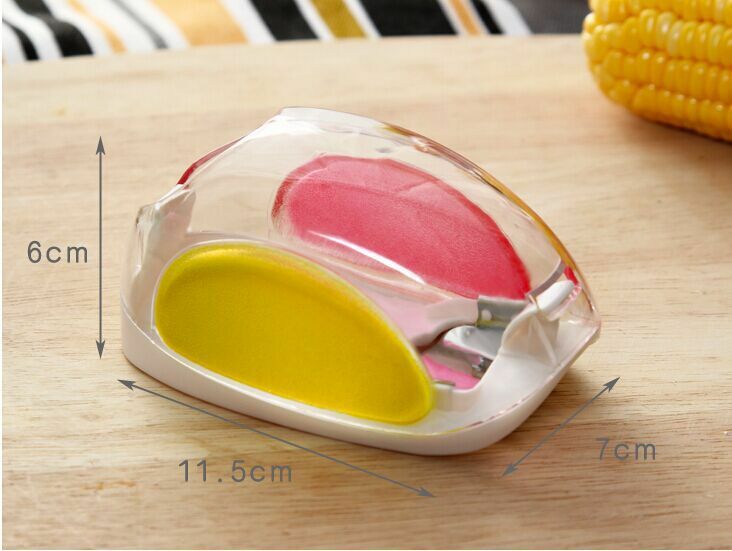 -This corn stripper can be disassembled without much effort for easy cleaning, it is also dishwasher safe to save your time. Be careful when you use, the blade is very sharp; Small kids are not allow to play it. Fast shipping, quality products! I recommend the seller! glad it got here. very cool item. now i buy stuff like the to make my life and eating/preparing my food thats ready to go with no garbage. love this corn cob stripper thing- a- ma- jig is pretty awesome. i grow all my own food so this will be nice to have to enjoy my homegrown corn. love the design of this item. made nice and im sure it will do the job. ill leave more feedback later. thanks again. need to gently brush, because itself thin cleaning and sharp knife. hard to brush must corn force. Very intelligent cutter. Very practical and fast kitchen tool. Thank you seller. Fast shipping and delivery. came fast. I haven't use it yet. thank you!